As far as hockey seasons go, it’s hard to come closer to perfection than the American Hockey League’s Texas Stars did in 2013-2014. The Stars entered the year viewed as one of the league’s top teams, and they didn’t disappoint. They stood tall on top of the AHL’s standings for much of the season and ultimately finished with the league’s best record, going 48-18-10 for 106 points. Their success didn’t stop at the completion of the regular season, as the team prevailed all the way to the first Calder Cup championship in franchise history, defeating the St. John’s IceCaps in five games in the final series. In terms of individual accomplishments, center Travis Morin led the league in scoring with 88 points, and for his efforts was the recipient of the Les Cunningham Award as the AHL’s most valuable player. He was also awarded the Jack A. Butterfield Trophy as playoff MVP thanks to 22 points in 21 games. Left wing Curtis McKenzie, who played alongside Morin on the team’s top line, scored 65 points and was named the AHL’s rookie of the year. After such a successful season, one where the team was able to find answers to all of the questions that they faced, the next question then becomes obvious: can they do it all over again? Winning back-to-back championships is a rare occurrence at most levels of hockey, and the AHL is no exception. The Hershey Bears were the most recent team to do it, repeating in 2009 and 2010, but before that you’d have to go all the way back to the 1990 and 1991 Springfield Indians teams before you’d find that level of sustained success again. 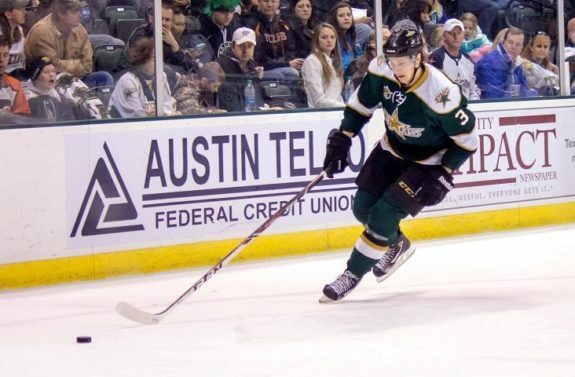 However, when taking a look at the Texas Stars’ roster now, with the 2014-2015 season just around the corner, the team appears to have all the necessary ingredients to once again climb to the top of the AHL. Offensively, the Stars were a powerhouse last season, scoring the second most goals in the league with 274. The team might be hard-pressed to completely match that same level of output this year after this past summer’s free agent departures of key veterans Mike Hedden (KHL), Chris Mueller (New York Rangers organization) and Dustin Jeffrey (Vancouver Canucks organization), but the Stars will still have enough talent remaining to go goal-for-goal with any team in the league. Morin and McKenzie both return, as does winger Brendan Ranford, who was the third member of the team’s top line during last season’s playoffs. Ranford is only 22, and is one of the leaders of a group of skilled young forwards that should all grow and improve their offensive output this season. That list also includes former Dallas Stars first round draft picks Scott Glennie and Radek Faksa, as well as Brett Ritchie, Justin Dowling, and Matej Stransky. 33 year-old Greg Rallo, who previously played for Texas from 2009-2011, rejoins the team in an attempt to resupply some of the veteran experience that was lost. As good as the forward group looks to be this year, the blueline looks like it might be even better. Like the forwards, the defense will have the advantage of having many familiar faces return to continue guarding the team’s own zone. Jamie Oleksiak is currently still in Dallas after surviving the parent club’s last round of preseason roster cuts, but is likely to be sent back down eventually, where he’ll join other young returning defenders Jyrki Jokipakka and Cameron Gaunce, as well as veterans Maxime Fortunus and Derek Meech. What truly makes the defensive group so interesting this year, however, are the new faces that will be joining it. 22 year-old Swede John Klingberg will finally be making his long-awaited full time debut in North America after having spent the majority of his career so far in Europe. Highly-skilled and possessing impressive offensive instincts, Klingberg scored 28 points in 50 games last season for Frolunda in the Swedish Hockey League. Also new to the blueline is Julius Honka, who was selected by Dallas 14th overall in the 2014 NHL Entry Draft. Despite a small stature and only being 18 years of age, Honka is a wizard with the puck, and showed during the preseason that he is ready to handle the level of competition that the AHL offers. In goal the Stars will use the tandem of Jack Campbell and Jussi Rynnas as their last line of defense. Campbell is yet another former Dallas first round draft pick on the team (11th overall, 2010), and despite injuries that limited his number of starts last season, was exceptional when he did play, posting a 12-2-2 record and .942 save percentage. Joining him from Finland’s SM-Liiga is the newcomer Rynnas, who likewise posted phenomenal numbers last season, going 28-5-7 with a .939 save percentage. The two goalies will battle head-to-head for playing time, which will give the Stars’ coaching staff the luxury of playing whoever is hotter at any given time. Speaking of coaching, undoubtedly the greatest loss that the Texas Stars suffered over the summer was that of now-former head coach Willie Desjardins. Desjardins, voted the AHL’s best coach in 2013, was very deservingly hired by the Vancouver Canucks as their new head coach, which will mark the first time in Desjardin’s career where he will be a bench boss at the NHL level. While it isn’t easy to replace a coach of Desjardins’ caliber, Texas feels that they’ve done just that with the hiring of Derek Laxdal. Laxdal coached the Western Hockey League’s Edmonton Oil Kings for the last four seasons, impressively guiding them to two WHL championships and one Memorial Cup victory, which came this past spring. Laxdal has a rich history of coaching success, and there’s nothing to suggest that it shouldn’t carry over to the AHL level. Heading into this upcoming season as the defending champs, the Texas Stars will be the team to beat in the AHL. Judging by the deep, talented roster that the Stars will have at their disposal, however, that’s going to be a lot easier said than done.